Excellent filter that was easy to fit. Had to use the small extension to make it fit, so make sure you buy that just in case. The water has changed noticeably. Hair is softer and skin feels less dry. What’s also great is there is no limescale to clean off in the bathroom. For the price it’s very economical. it was leaking initially from the centre but soon rectified as the rubber washer had come away during transit. Cant actually use the product at this point as fixture does not fit to my shower ** Reply from PS ** Sorry to hear that the product doesn't fit Stuart - we've emailed you now to see if we can help or if you just need a refund. 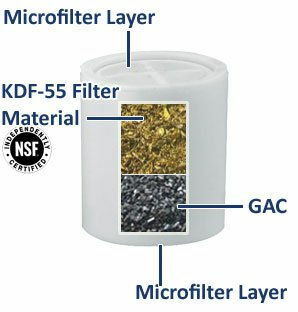 I installed this filter a couple of weeks ago and have been very impressed with the results. I had problems with grout between tiles turning yellow and black watermarks around the bath. Since fitting the filter these problems has stopped. Fitting was very easy and although the unit is more bulbous than I expected this did not cause any problems. Would recommend this to anyone who felt their water could be cleaner and healthier. After an initial problem with a leak owing to the incorrect positioning of the central washer the filter now functions perfectly and definitely makes a difference to the quality of the water. I recommend that the inadequate instructions accompanying the filter be rewritten and presented in greater clarity and detail. However, after sales service via email was commendably helpful. Exceeded all our expectations. You will not be disappointed. Excellent product which filters out all the heat exchangers metal fragments and stops the showerhead from clogging up which previously resulted in having to replace it every 4 to 6 weeks even after the showerhead is constantly descaled. Product sizes needs to be slightly more clear since we were not sure it was going to fit, however it did fit just but is very tight against the tiles. I have had this shower filter installed for a couple of weeks now and it has been a great purchase. Living in London I have hard water. It can clog the shower head with lime scale and leave hard water marks on the glass. Works to filter...but leaks from centre. ** Reply from PS ** This can sometimes happen when the middle seal moves out of place during delivery and can be easily fixed. We have sent you instructions. The filter leaks. ** Reply from PS ** Thank you for your review, we're sorry that your filter initially leaked. This can happen sometimes when the internal seals move out of place during transport. But we are glad we were able to help you fix this issue by sending videos and pictures. Fit my rain shower perfectly and no much loss on pressure! Third purchase so far of the compact shower filter. Filter works really well, I can feel the difference as my skin is not itchy anymore. It doesn't reduce water pressure as other filters I have tried. A great product, has definitely made a difference to our hard London water showers! Very pleased. Brilliant does the job, Water feels softer. Bought for my daughter who suffers from eczema. She was amazed at the difference this filter made. Easy to fit, does not impead the water flow and is unobtusive. Highly recommend. easy to install, my hair feels a bit nicer but not quite as good as in a soft water country! Arrived quickly. Was easy to fit. My girlfriend reports that her hair is much softer after using this filter. Has not affected the flow from the shower. Really pleased with the product. 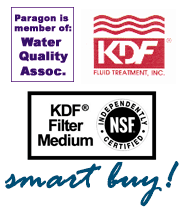 An affordable way to find out if filtering the water is worthwhile for you. Not perfect, but very close! I actually combine this filter with one of the shower head filters too, since I live in a very hard water area. I wash my hair with only water and the filters have made this possible - using hard water is disgusting. I can tell you now that it’s not absolutely perfect; it’s not the same as soft water, but it’s pretty close. My hair now never gets greasy, I simply wash it every few days to restore texture. Arrived on time and was easy to fit using recomended extension. Excellent customer service. Amazing product and price too! Highly recommend. The Slimline shower filter has made a lot of difference to my hair and skin. The Slimline shower filter has made a lot of difference to my hair and skin. Both are softer than before and it has also helped reduced hairfall massively. A big fan of it and would happily recommend it to anyone with hairfall or skin problems. Has made a definite difference to our water quality which leaves hair and skin much softer. I spent ages going through the reviews on here to decide whether this was going to be worth it or not - I have suffered with itchy skin since I moved to a hard water area 8 months ago, It took me until 2 weeks ago to realise that it was the water causing the itching. I was 1 click away from buying a really expensive water softener when I found this website and boy am I glad I did - It's as small as it probably can be to be effective enough so I cant really complain there - Most importantly it works! No more itchy skin! My hair feels healthier too - If you are having doubts look at it this way, £500 for a water softener plus the annual costs or £50 odd quid a year for this little device - I know what I would rather chose - Well done pure showers - you have a customer for life! I had psoriasis all down my back, not severely, but enough to be uncomfortable, itchy and really unsightly. Since owning this product for the last couple of months I can honestly say that the psoriasis has 99% cleared. What a relief!....Although I do have one thought....how long approximately until the filter needs replacing? My husband and I shower every day...average wash....we're not in there for hours singing our hearts out...just a general good scrub?? ** Reply from PS ** This unit should last approx. 8 - 12 months, depending upon usage and the quality of the water in your area. My wife was suffering from itchy skin when getting out of the shower. this has now all stopped due to the filter. It does what it says it does and that's what really matters. Great customer service and always happy to help. Larry. I'm very pleased I have chosen to get my shower filter from here, the customer service has been great, they replied quickly to my queries and let me have two filters to choose from and accepted the return of the one I didn't go for. Thank you. 2 minutes to fit and then you get a much healthier shower,great stuff ! Much bigger than I expected. Photo makes it look a lot smaller. Happy with it. Early days, but all seems fine & it looks elegant! Good filter, hair feels noticeably different after rinsing. Had a slight problem after fixing the filter initially but this was sorted quickly after contacting Pureshowers. I bought it as a reserve, therefore unused. The water feels so different from the first shower, I love it! Excellent product. Moved to very hard water area and after several months began to suffer from awful effects of hard water on my skin, scalp and hair. Itching scalp to the point of pain. Hair dill, lifeless and hard. Was a bit scepical about this product but worked amazingly from first time. Use a clarifying shampoo on hair to remove residue. it appears to do what is required and we are very pleased with it. Does not fit the shower unit that we have installed ** Reply from PS ** Sorry to hear it doesn't fit your shower, our filters fit all standard showers (around 99%). We'll email you to see if you need help fitting it or if you just want to return it. Excellent product that does what it says on the tin!! We installed shower filter in bathroom and immediately noticed the improvement in quality of water. Since then we have completely revamped the en suite bathroom.As all pipework was hidden behind the water board walls of the shower, the plumber fitted the second filter in the nearby airing cupboard out of sight.Excellent piece of kit and had plenty of assistance from PURE SHOWERS. Got the slim line shower filter and i must say it has reduced the limescale in the shower. We live in a hard water area and i have also notice an improvement on my skin. We have been using this product for about 3/4 weeks now. Enjoying the soft water. My son now has no symptoms of eczema. No itchy skin or dandruff since using shower filter. Wouldn't want to be without it! Arrived very quickly - a doddle to fit - works a treat. Happiness. The water feels softer, less chalky and it was good that it came with different adapters for larger or smaller shower heads.. very easy to assemble. However I wouldn't say the size of a fist is slim line but that's just me. Overall I loved it and would order it again.. It arrived very quickly and was really simple to fit. So far I have noticed my skin is less itchy after showering and my hair is softer after shampoo, don't need conditioner now! Shower filter has been in use for around a month now. Water feels much nicer and glass screen and shower head stay cleaner for longer (I'm in a hard water area). The filter does not seem to affect water flow. Quick delivery and great service. Very happy with my purchase. Works very well, my wife is thrilled with it and says her hair is less brittle. You may now get lots of orders from my area as I spread the word. Scottish Water changed our supply 4 years ago and many people now suffer from skin conditions etc. The fact that they were going to add even more chemicals to it shocked me. I happened across this shower filter wow it has been on 3 days the tiles are streak free still and my skin is already feeling softer and less itchy. Our water is off the scale hard. It was causing skin problems and very dull brittle hair - coming from beautiful soft Scottish water this was very difficult to accept. Am delighted with the filter, it's made such a difference. The shower is easy to clean and I don't have dry flaky skin! Oh, and it's easy to fit, only takes a couple of minutes. The slimline filter looks good, however it leaks if done up too light, or too loose, so it has to be tightened up just right for it to only leak a small amount. I had the none slim line version and that was much better. ** PS Reply ** Thank you for leaving your review Michael. Can you please try using some plumbers tape on the threads of the pipe? Unfortunately not everyone's pipes are exactly the same and sometimes a little plumbers tape is needed to create the perfect seal. Never use this product. The filter seemed to be faulty & appeared to have been returned previously. The very limited instructions were for another product. It was impossible to screw it tight after opening. The only good thing I can say is that the company kept their word & refunded without quibble. ** PS Team Reply ** Sorry to hear you weren't completely satisfied, all are products are brand new. As always we will honour our 100% satisfaction guarantee. The slim line filter is quite big, saw previous review about having to move the shower out from the wall a bit so I order the angled pipe to solve this problem. Turns out I didn't need it. Filter was very easy to fit. I haven't been in the shower since o fitted it but I did run the shower for a bit. I'm amazed at how clean the water smells. Really impressed with this product, and all before I've even used it properly. Thanks pureshowers! I am very happy with the shower filter, we had a few problems with leaks but after some adjustment and trying washers in different places we stopped the leaks. The itching I suffered on my skin has completely gone and it is like showering in rainwater. I am very satisfied! Happy to find a filter that suits our household needs.one of the filter didnt have any instructions, I had to look it up on you tube.the filter didnt quite fit with our existing tap and needed some silicone tape to bridge the gap.Delivery was on time.not alot of packaging.perhaps could do with some bubble wrap for protection. Overall satisfactory product.i will just need to change the filter next year which is ok .
fast delivery and easily fitted. Job done! fairly easy fitting to our new shower control, it performs well in addition to the descaling it also retains the grit in our water supply. I can recommend it. Filter has made such a difference to my chlorine allergies. Very happy with product and service am I am going to purchase a filter for my other shower. So glad I came across your website. I purchased this item for my elderly mother after she had a new bathroom installed. I decided on the in-line version because i thought that the shower head version would be to heavy for her. My mother is very happy with the product. I've been using the shower filter for a month now, and I think it has made a difference as my skin and scalp don't feel as dry anymore. I've used the shower filter for a couple of months now, and I can honestly say I can feel and smell the difference in the water, and of course my skin and my hair feel much nicer and softer! Works great, shower head no longer needs its weekly descaling. My glass shower doors now stay a lot cleaner. I shall be buying some more for the main bathroom. This product is brilliant because it resolved our dandruff problem. Thank you very much. Fast delivery, dry skin improved after only a week. Fantastic product. A fast delivery, & a product that was easy to install & definitely makes a difference to the quality of our water. Wish I'd done it sooner... glad I have it now! Service was rapid though no personal interaction. Many people don't like the personal touch, but I think it can be good if done right. Older people love it :¬). Other than that, a rapid, low cost service providing an excellent product that feels fantastic in the shower.